The Three Palaces Festival is a young festival which has grown into a prestigious international event that continues to develop its reputation doing credit to Malta’s cultural calendar. 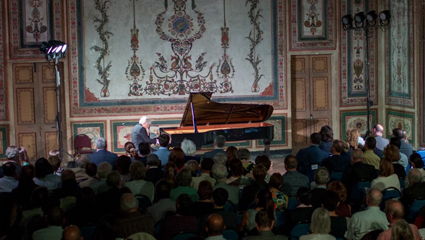 The Festival’s principal aim is to uphold and integrate the excellence of music matched only by the uniqueness of its setting – Malta is rich in tradition, heritage and culture and this is reflected partly through four centuries of the Knights of St John rule. The Three Palaces Festival was built on the foundation of community engagement and this spirit. The philosophy of the festival is that everyone should have the right access to heritage sites, to the transcendent beauty of art, as well as the right to participate in the expression of music. It aims to build an even more inclusive and welcoming environment in which people see themselves reflected in the art, and feel the connection between historical and modern music that reflects the true identity of a nation and beyond. The purpose of The Three Palaces Festival is to present the finest performers and develop new dialogues between the audience, musicians, established world stars, young talent and future leaders of the performance world. The strategic aim of enhancing and fully developing Malta’s great arts presence on the world’s stage is tied to that of raising the next generation of professional performers. The festival gives young people the opportunity to experience and participate in masterclasses led by international and local artists. The Three Palaces Festival offers educational opportunities for all age groups by stretching and occasionally challenging listeners with music they may not have heard before.